A trio of wind-related issues to wrap up the work week. As a storm system stalls over the Great Basin, expect southwest winds in the 20-40 MPH range today. For that reason, a Wind Advisory has been issued for all of southern Arizona from 1-8 PM. Winds may produce blowing dust and reduced visibility along I-10, especially near Picacho Peak and the Willcox Playa. Gusty winds combine with low relative humidity and dry vegetation to create a critical wildfire danger today. All of southern Arizona is under a Red Flag Warning from 10 AM until 8 PM. Any fires that develop or are ongoing today will have the potential to spread rapidly. Outdoor burning is not recommended. Finally, winds whip up enough airborne dust to decrease air quality. Metro Tucson is under a High Pollution Advisory this afternoon, as air quality reaches unhealthy levels for sensitive groups. Those with respiratory or heart issues are advised to stay indoors today. Another windy afternoon for the Sonoran Desert. A departing cold front cranks up winds starting this morning. 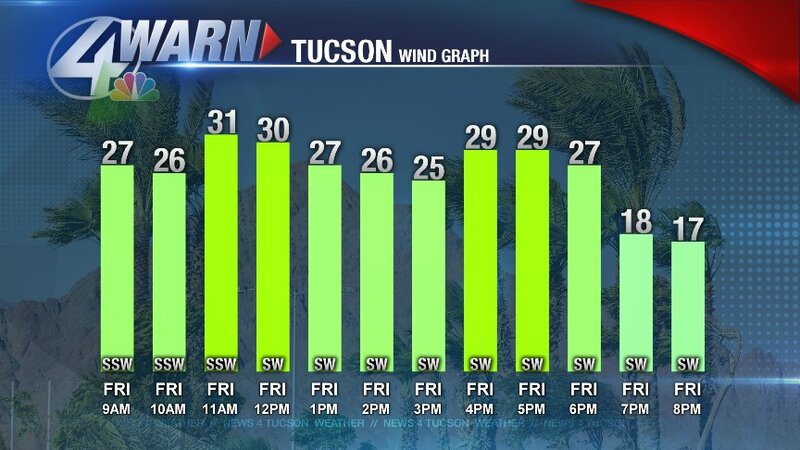 Metro Tucson can expect northwest winds gusting around 20-30 MPH. Areas east of Tucson could have gusts approach 40-50 MPH, where a Wind Advisory is in effect. Blowing dust may once again be an issue on I-10 today, especially east of Willcox. All of southern Arizona remains under a Red Flag Warning, thanks to gusty winds, low relative humidity and severe drought conditions. Outdoor burning is not recommended. Highs today run roughly 10° below average under sunny skies. Lows for the Old Pueblo drop to the upper 30s to low 40s by daybreak Saturday. Freezing temperatures can’t be ruled out for portions of Santa Cruz, Cochise, Graham and Greenlee Counties. For that reason, a Freeze Watch is in effect overnight. Warmer temperatures return to the forecast this weekend, with high ranging from the low 80s Saturday to the low 90s Sunday. A powerful Pacific cold front brings a slew of issues for the Sonoran Desert. There are four reasons why this afternoon’s weather will be nasty. Between this morning and late this evening, valley floors will experience west-southwest winds around 20-40 MPH. A Wind Advisory is in effect for much of southeastern Arizona during this timeframe. Meanwhile, wind gusts may approach 60 MPH in the mountains. The Sky Islands are under a High Wind Warning today. Combine gusty winds with low relative humidity and the ongoing drought & you have the recipe for a high fire danger. A Red Flag Warning is in effect for all of southern Arizona today. Any wildfire that develops could grow out of control quickly. Burning & BBQ’ing are not recommended today. On the roads, drivers may experience blowing dust. 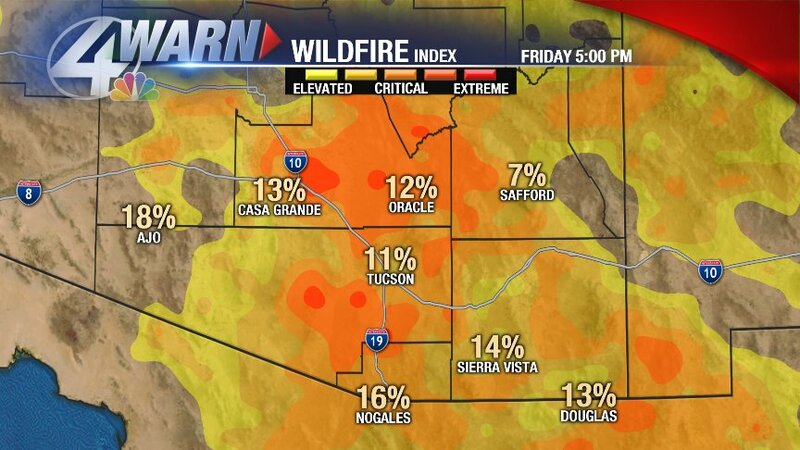 Areas of greatest concern include I-10 around Picacho Peak and the Willcox Playa. Visibility may be reduced at times. Remember to pull aside, stay alive! Those with respiratory issues may want to stay inside today. Pima County Department of Environmental Quality has issued a Health Watch for elevated particulate matter, including wind-blown dust. 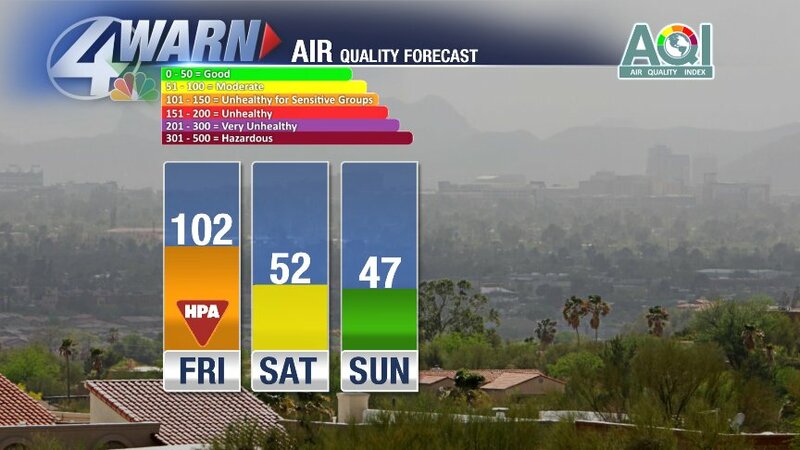 Air quality will be approaching unhealthy levels for those with health issues. Wind-blown dust may remain in the skies Friday as well. The upshot to this pattern chance? Temperatures drop from the mid 80s today to the low 70s tomorrow. Today – Partly cloudy, windy. 87°, west wind 20-30 MPH. Tonight – Mostly clear. 55°, west-southwest wind 5-15 MPH. Tomorrow – Mostly sunny, breezy. 77°, west-northwest wind 10-20 MPH. Gusty winds produce a high fire danger & blowing dust threat to end the work week. A Red Flag Warning is in effect today from 10 AM until 8 PM. Outdoor burning is not recommended, including backyard barbeques. With westerly wind gusts around 40-50 MPH today, a Wind Advisory is in effect from noon until 8 PM. In addition, a Blowing Dust Advisory is in effect from noon until 8 PM for the I-10 stretch between Willcox and the New Mexico state line. Visibility may be reduced to less than a half mile at times. Cranking up the winds today and tomorrow is a cold front advancing toward the Four Corners. Enough moisture is in play to produce an isolated shower or storm this evening in Southeastern Cochise County. Isolated showers can’t be ruled out tomorrow east of Metro Tucson. Highs range from the upper 80s today to the upper 70s Saturday. Breezes linger tomorrow, with areas east of Tucson under a Fire Weather Watch. Gusty winds look to take a prolonged break beginning Sunday. Today – Mostly sunny, windy. 86°, west wind 20-30 MPH. Tonight – Mostly clear. 57°, south wind 5 MPH. Tomorrow – Mostly sunny. 85°, west-northwest wind 10-15 MPH. The National Weather Service has issued a Red Flag Warning for much of Southern Arizona. This is in effect from 2 PM until 8 PM. Outdoor burning is not recommended today, including Metro Tucson. In addition, a Wind Advisory is in effect from 11 AM until 8 PM for Metro Tucson & points east. West winds could gust as high as 40-50 MPH through this evening. Eastern Cochise County is under a Blowing Dust Advisory for the same timeframe. Reduced visibility is possible from the Willcox Playa to New Mexico state line. Gusty winds decrease tomorrow, as a storm system passes east of the state. Models hint at a new storm system by Thursday, bringing back the breezes through the first half of the weekend. Daytime highs Saturday drop to the upper 70s, which could stand as the coolest day in Tucson until Autumn. Today – Mostly sunny, breezy. 69°, west wind 15-25 MPH. Tonight – 10% chance of showers. 44°, southeast wind 5-10 MPH. Tomorrow – 20% chance of showers. 71°, west wind 10-20 MPH. A gusty and dusty end to the work week. Areas east of Tucson are under a Wind Advisory today. 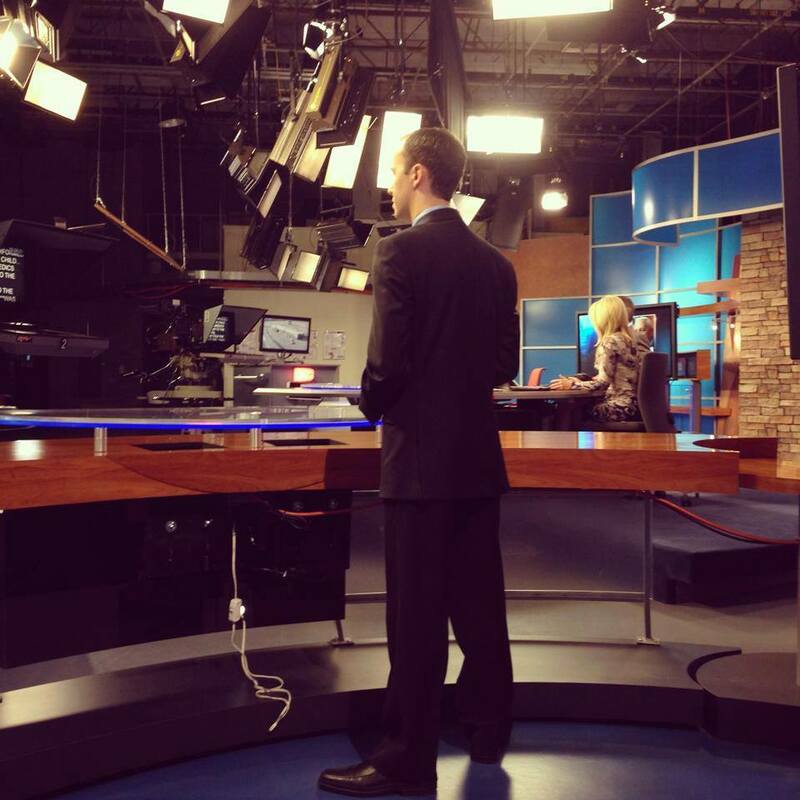 Through 11 AM, a Wind Advisory is in effect for Western Cochise, Graham and Greenlee Counties. Eastern Cochise County is under a Wind Advisory and Blowing Dust Advisory until 5 PM. Wind gusts in these areas could exceed 40 MPH. In addition, a Red Flag Warning is out for the southern and eastern sections of Cochise County and extreme southern Graham & Greenlee Counties from 11 AM until 7 PM. Outdoor burning is not recommended in this area. Metro Tucson can expect westerly winds gusts up to 25 MPH through late afternoon. Poor air quality is anticipated to linger through the day in Eastern Pima County. Those sensitive to changes in air quality are advised to stay indoors today. Afternoon temperatures reach the upper 60s. Isolated showers are possible late tonight through the daytime hours tomorrow. Rain chances for Metro Tucson range from 10% after midnight to 20% Saturday afternoon. Wind gusts may reach the 20 MPH range to start the weekend, decreasing by Sunday. Dust over the California desert, captured Thursday by Sean Parker. This is the reason our skies are so hazy today.